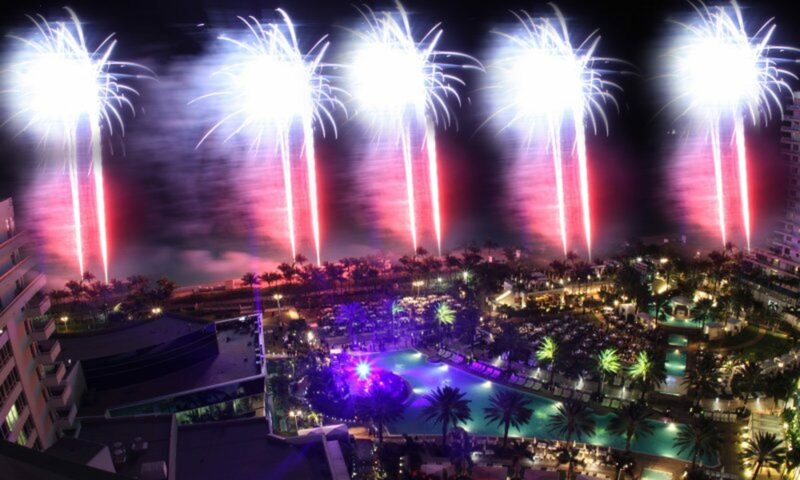 Close Proximity Wedding Fireworks are shows designed for areas with limited space. Also widely used for entertaining groups of people such as for corporate events, grand openings, weddings, quinces, and any type of event. These fireworks are designed to have a lot less fallout area which allows these displays to be performed where space is limited and close to spectators. Wedding Fireworks are more and more widely used every year. It gives a great touch to the celebration. We can design any length of show you want from a 1-2 minute intense show to longer 4-6, 6-8, 8-10 minute shows with opening, body & finally. 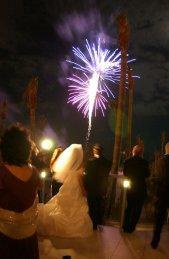 Much longer and larger wedding fireworks shows also available. We will provide you with an “up close and personal” experience. This display has a wide variety of low-level effects visible from ground level to a height of 200 feet in the sky. A 150-foot radius is needed from the discharge area to the audience viewing area for this type of display. We handle all the logistics from A-Z. From the very beginning with the permitting process to the very end with the cleanup process and everything in between. Our crew are fully trained, licensed and insured to shoot these display so feel confident you are dealing with professionals when it comes to your wedding fireworks! One of our client's testimonials on her wedding fireworks. Ernie is the best! This is the second time I use their services for my event. The first time they did an amazing wedding fireworks show (which people still talk about). This time I used their services for lighting at my wedding. They did bistro lights, interior lighting, dance floor lighting, and French lamp posts. A great vendor with no problems. Set up and services exceeded my expectations! Check out our online novelty store www.miamisparklers.com for consumer Sparklers, Wedding Sparklers, VIP Bottle Sparklers, Misty Stix, Flying Lanterns, Co2 Cartridges & Confetti products such as confetti sticks & confetti cannons.